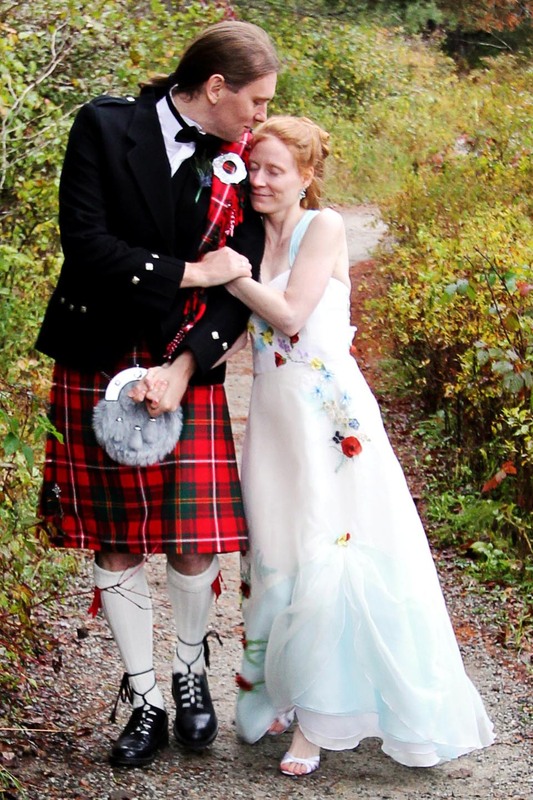 An ethical wedding dress custom made of hemp and silk organza printed with ferns. 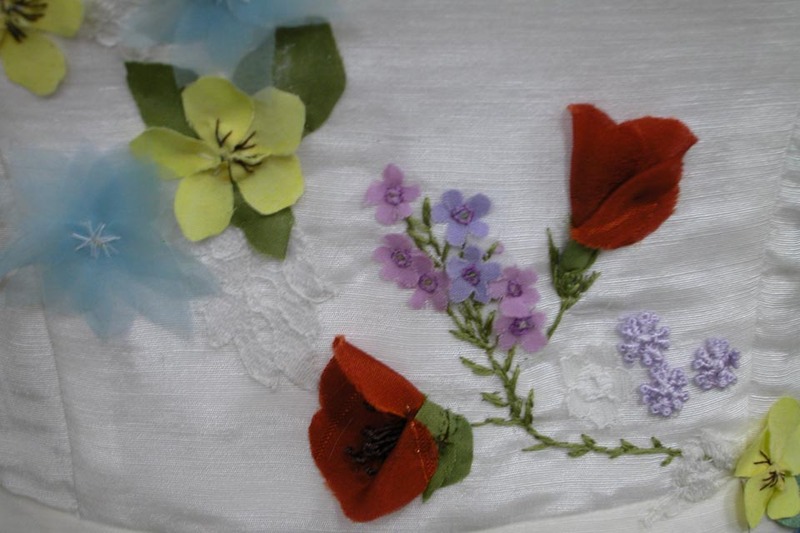 Hand-embroidered butterflies including the Peacock butterfly, Bog Copper, American Copper, and Karner Blues adorned her gown among the poppies, chicory, violets, and mountain laurel. Fire ordered a custom version of Persephone. 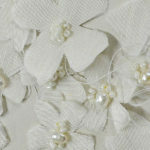 Her ethical wedding dress was eco-friendly, made of hemp and organic silk. 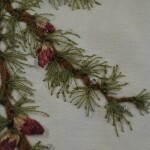 Layers of silk organza were printed with ferns. 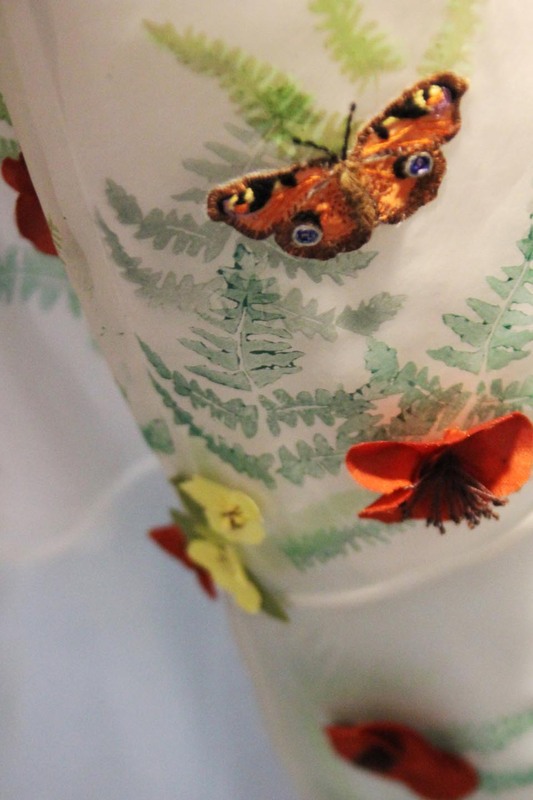 Hand-embroidered butterflies including the Peacock butterfly, Bog Copper, American Copper, and Karner Blues adorned her gown among the poppies, chicory, violets, and mountain laurel. 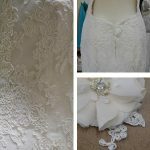 Lace from her mother’s wedding dress was incorporated into the details. Fire is a palaeoanthropologist who studies human and mammalian evolution and thinks it is the most “magical”, perfect, amazing, science. She loves fieldwork and spends her time educating and exploring all over the world. 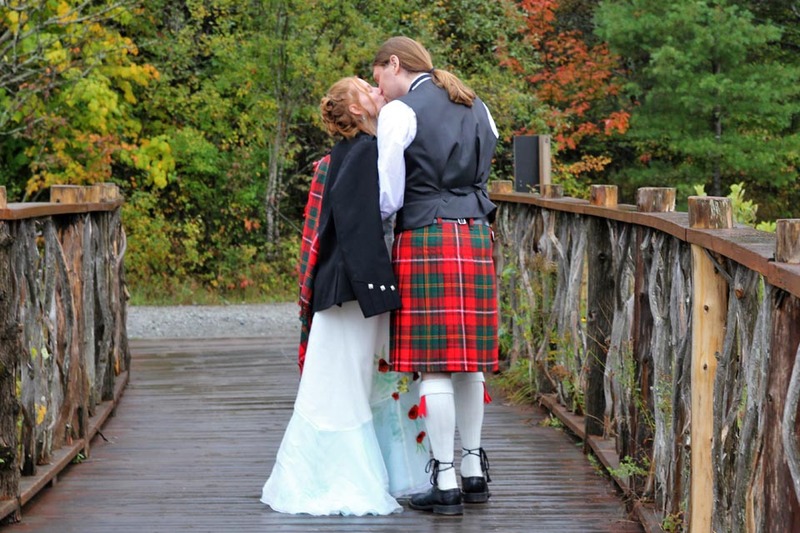 Our Adirondack wedding weekend was based around the Ampersand Bay Resort in Saranac Lake, NY, right on Ampersand Bay. Our Friday bbq and Sunday brunch were held there, and about 75% of our guests stayed there, too. Everybody could choose how to spend their free time–using the canoes or pontoon boats, hiking, relaxing with the organic coffee and homemade lemon bread and cookies that my mother had put in every cabin, shopping in Lake Placid 30 minutes away… we knew everyone would experience the area in the way that most suited them. 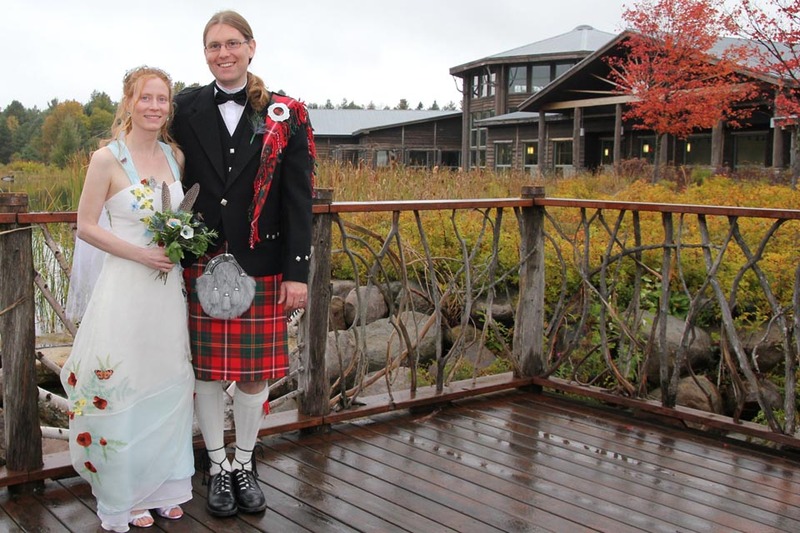 The wedding ceremony and reception were in Tupper Lake, NY, 30 minutes away at the Wild Center, a museum dedicated to the natural history of the Adirondack region. I wanted my wedding money to go to a place that is dedicated to such inspiring and meaningful work. By bringing our guests there we could share with them something that means a great deal to us, and they would learn about the Wild Centre’s mission in the meantime. Personally I find museums, particularly natural history museums, to be the most beautiful human-created places on earth. So much knowledge is contained within them, all of it preserved, communicated, and studied for the common good. I’ve had bouts of goose bumps just from walking into a few of these sorts of museums and the Wild Centre does it to me every time. 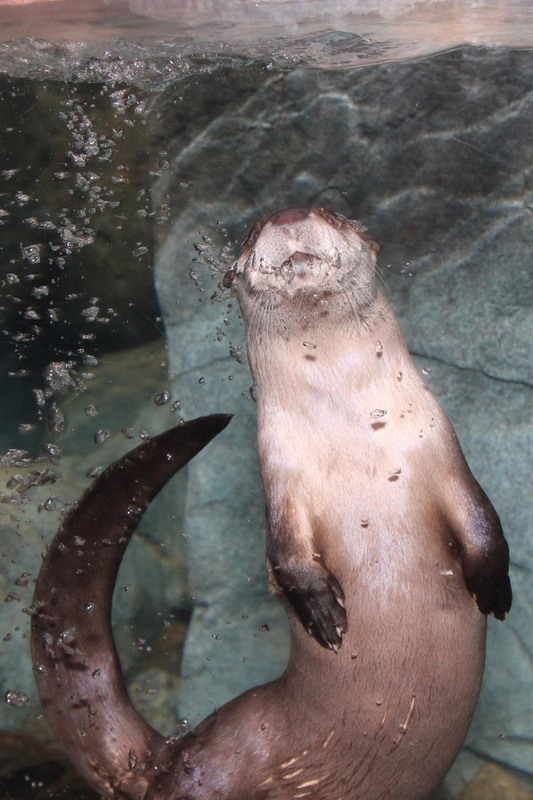 Plus, it has otters! And the most engaging, dedicated, generous-spirited staff you could ever hope to meet. Everybody there seems to love what they do and, as a result, we love it, too. 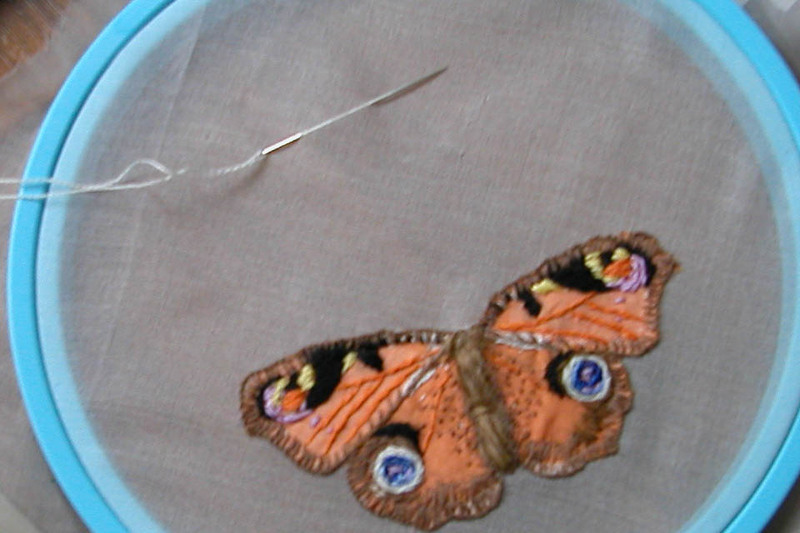 Fire choose butterflies to represent her late family members and a close friend. 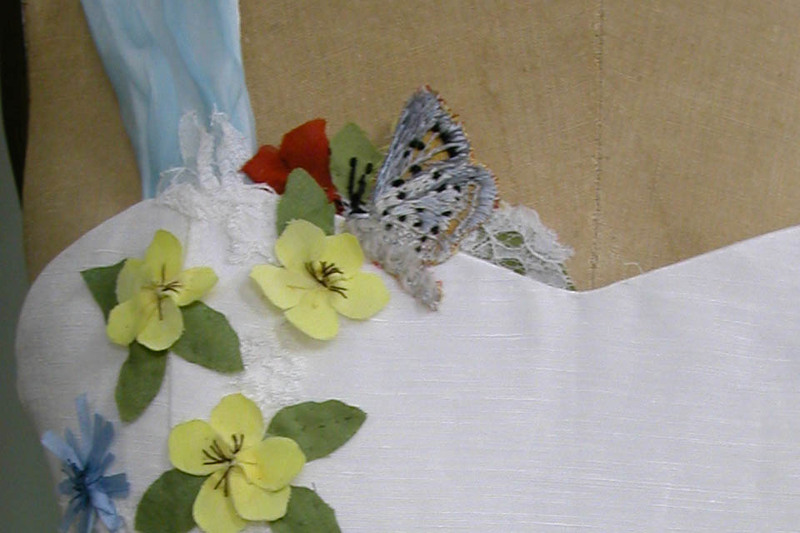 Butterflies landed on bits of lace taken from her mother’s wedding dress. We wanted it to feel like a family reunion in the Adirondack Mountains and we wanted to inspire people by the natural environment. This is why we decided to spend a lot of money on making it a three day event rather than on things we don’t care about, like covers and bows on the chairs and manicures and make-up sessions. We also wanted to put our money where our ethics are. We sought out artists and business people whose work and spirit we admire – we didn’t buy anything substantial unless it was going to be useful, meaningful and came from somebody we wanted to support. Almost everyone we met while planning the wedding is somebody we’d like to be friends with. They all share our love of recycled, useful goods that are made in respectful, sustainable ways. Generally, we also tried to purchase things when required to fill a certain wedding function that could be used again (and to rent things where possible). Everything was printed on recycled paper and we worked with graphic artists on a bespoke invitation that we printed ourselves. We printed our rsvp cards on recycled origami paper and found a talented artist who made them into woodland animals that we used as place cards once they were sent back to us. Everything was posted in recycled envelopes and we saved on paper by putting as much information as we could on a website that we created ourselves. Instead of having an official ring bearer carry a little pillow, we found a woman who cut us a disc of cedar into which she carved the word ‘love’ entwined with an infinity symbol. A small ribbon held the rings in place and we let my little cousin carry this in a basket during the ceremony. It served its purpose then – and now serves as another candle holder. Rather than a guestbook that gets tucked away in a cupboard somewhere, my sister gave us three handmade, wooden tree puzzles and every guest signed one piece on the back. We had two trees painted in autumn colours at the US wedding and one painted in shades of green for the summer wedding in the UK. When we buy our house this spring, we will mount all three on a wall. The wedding industry has a sneaky way of making people buy too much and waste even more – we tried not to do that. 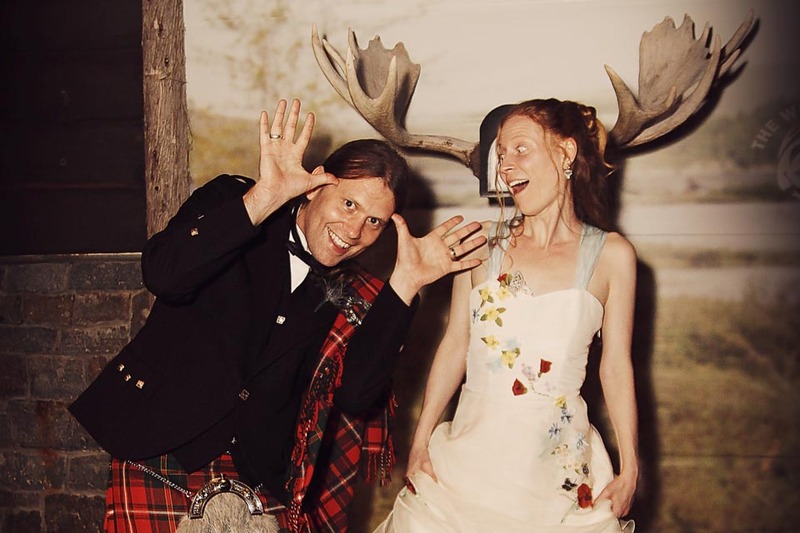 We tried to have an ethical wedding. 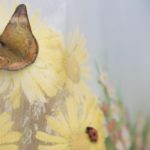 I was dead set against the idea of having real flowers, to put so much money into something that is grown only to be cut down and never used again… it felt like a waste. Besides, I thought they would detract from what was a beautiful autumnal setting in the mountains and the purpose of the museum. However, we wanted to keep the feel of the traditions of having bouquets and centerpieces, so I approached Cabin Fever Floral for help. I essentially walked into a florist’s shop and asked the owner to make me something without flowers. Our table centrepieces were birch branches propped upright in vases which supported the ceramic ornaments I had made as favours. We rented most of the vases so they could be taken back and used again. Nick was wearing a kilt, so we did get him and the other men a thistle to wear, in keeping with Scottish tradition. For bouquets we had simple greenery, feathers I collected during my field research in Kenya the year before (from guinea fowl and birds with fabulous names like superb starlings and lilac-breasted rollers) and handmade flowers from a ceramic artist in Israel that I discovered on Etsy. The ceramic flowers constituted one of the gifts that I gave to the women in the wedding. A few “mobile” pieces were potted by my Aunt Peggy with fresh herbs in baskets. We had eight people in our wedding and we told them to wear any dress or suit they wanted to, provided for the women it was a dress in one colour. This meant that everyone could work with their budget, taste and figure without worrying – and maybe get some usage out of a bridesmaid dress they had to wear before. Everyone looked stunning in their different colours and styles, probably because they felt comfortable. Most of our food was local, seasonal and vegetarian where we could convince my family! Cider donuts were an absolute must. Green Goddess Foods catered our bbq and brunch. My mother and I drove to the Finger Lakes region of NY and visited a small, organic, bio-dynamic vineyard to select a few cases of wine and we supplemented it with locally made hard cider and the usual non-alcoholic bevvies. Myself, a few friends and an uncle also brought bottles of whiskey for an impromptu post-bbq whiskey tasting. It transpires that warm apple cider and whiskey are a brilliant combination. 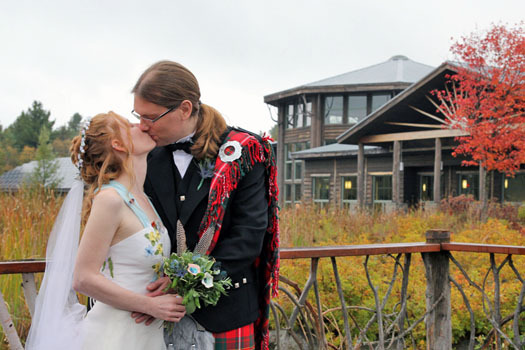 The wedding was catered by Adirondack Artisans, who have recently partnered with the Wild Centre. They took two of our own favourite recipes and made us a pumpkin and bean soup and a warm lentil, feta and carrot salad. Main dishes were a wholesome quinoa and mushroom dish for the vegheads. Petit fours from a local bakery were served with apple cider and champagne immediately after the ceremony. It felt so indulgent. The best ones were tiny Granny Smith apple cupcakes. When it came to the cake we could not make up our minds, so we went with three entirely different kinds which Cake Placid Bakery specializes One tier was lemon cake with raspberry filling, the second was chocolate with caramel filling and the final tier was cinnamon cake with maple filling. Each tier was a different colour (green, blue and yellow to represent the earth, sky and sun) with shades of that colour in small frosting “tiles” along the bottom edge. The same artist who made us the ceramic flowers in our bouquets made a little tray with two birds on it, which sat on top of the cake and now doubles as a candle holder at home. Funnily enough, the cake is the one thing that Nick and I disagreed about the most! I wanted something very un-wedding-like and vibrant, but this is where he wanted to be as traditional as possible with a plain white cake and a ribbon. I thought it looked beautiful in the end, but it was much more sedate than I had envisioned. On the other hand, Nick thinks it looked like something you eat at a circus. I suppose we are quite lucky that this is the only thing we could not agree on – and anyway, it was really tasty, which sped us along the road to forgiveness for whatever cake sins we felt the other had committed against humankind. I handmade ceramic Christmas tree ornaments in my pottery class in the UK and we brought them with us to America for the wedding (if you ever want to be conservative with your checked luggage weight, packing ceramics is not the way to go about it). I wanted everybody to have a unique gift from us. 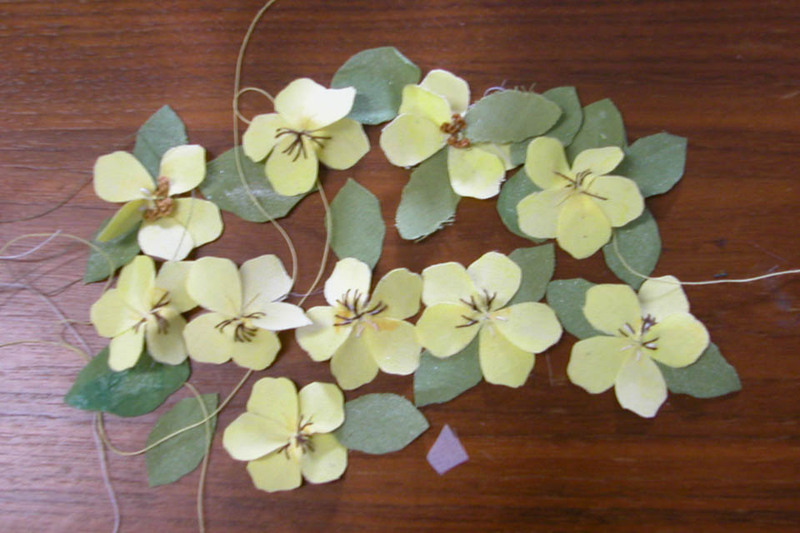 I created some with batik woodblock stamps, some with old lace and others with leaves and greenery that bloomed throughout the year. The ONLY thing I can say without a doubt did not go to plan was the weather – but, who can plan that? My biggest dream for the day of our marriage was to simply walk into the woods and get married- no buildings, no flowers, no bells – just being together outdoors and letting everyone appreciate what is already there for us! Sadly… it rained. We had to change things around at the last minute. The people at the Wild Centre were flexible and energetic. The “Find Out Forest” inside the museum was as close to what we wanted – but inside. It had lots of trees, interesting lighting and images of natural settings. Just to one side was an exhibit full of otters swimming and dancing behind us. The museum let us hold our ceremony there in the middle of the day, with patrons peeking in from behind. Towards the end of the night, Nick and I watched our slices of cake sit uneaten at our table and the ice melt into our delicious cocktails as we were distracted by spots of dancing, heartfelt goodbyes and giggles with guests. I’m not one to walk away lightly from baked goods (or cocktails, for that matter), and had my eye on the table. We sat down at one point, desperate to dig in, and my friend Mark walked up with a piece of drawing paper. He said “I think this message is meant for you guys” and we found, in perfect penmanship in four different shades of the Crayola rainbow, the words: EAT YOUR F****** CAKE. We couldn’t stop laughing. We knew exactly what he was trying to give us – a moment for ourselves. I took that paper back to my university office in the UK where it is now taped to my filing cabinet. It reminds me to stop and check in with myself. It reminds me that a tea break should really be a break. And sometimes it reminds me to put my work down, go home and have dinner with Nick. Everything else can usually wait.